Organic Skin Care is Natural Beauty you can See and Feel . . .
Natural organic ingredients are potent and give beautiful lasting results. For clearer, balanced, revitalized and a naturally healthy, and glowing complexion. We are proud to feature the Éminence Organic Skin Care Line because it offers a truly exquisite experience with products that are so natural you can see the fresh fruit pulps, seeds and smell the real herbs. The philosophy is simple and natural. These products contain 85-95% active ingredients which are an unique combination of handpicked fresh organic herbs, fruits and vegetables hand mixed with pure waters drawn from a thermal hot spring lake containing minerals found nowhere else on earth. Éminence products are paraben & sodium lauryl sulfate free. Éminence products are not mass produced and do not contain artificial coloring or fragrances. The ingredients are hand picked and hand harvested to ensure premium quality. 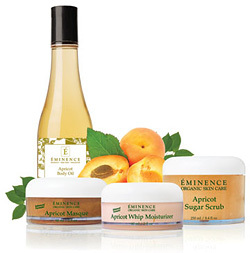 Every ounce of Éminence product receives personal attention to produce and package. After harvest, the ingredients are stored in temperature-controlled conditions for four months, during which time all traces of bacteria die off. They are next blended with a rare and completely unique water source: Lake Hajduszoboszlo. In 1925, a group of scientists searching for oil uncovered this subterranean thermal lake located in Hungary. Research revealed that the combination of salt and fresh waters in the ancient sea contained plant and animal life trapped for thousands of years by the earthquake, which submerged the lake. The resulting properties, including mineral salts and trace elements, produced rare and unique ingredients, and the 9.5 pH level of this lake proved soothing and good for dry skin. The layers of earth through which this water emerged also provided rich ingredients that had been fermented, heated (at approximately 73 degrees Celsius) and preserved for centuries. As a result, the Éminence line contains many ingredients previously unavailable to the beauty professional. If you would like to add Éminence Organic Skin Care products to your home care routine, we carry many of the Eminence retail products right here in Friday Harbor, WA and would love to see you. If you’re from out of the area, visit our online store at www.organicskincareplus.com where we feature the freshest Éminence products on the market plus Free Shipping on all orders in the US.